Chrichton's World: Review Star Wars: Episode V - The Empire Strikes Back (1980): Dared to end on a dark long before it was fashionable! Review Star Wars: Episode V - The Empire Strikes Back (1980): Dared to end on a dark long before it was fashionable! The Empire Strikes Back is without a doubt one of the best sequels ever made. It follows up events of the original and builds on what was set up. The main characters have become good friends and each of them contribute to fighting the good fight in their own unique way. But what is most spectacular about this film is that the world of Star Wars is expanded on considerably. Where the original was full of hope and empowerment The Empire Strikes Back is quite dark and gloomy. The rebels are resilient and determined but they get hit real hard several times throughout the film. In the large battles and on a personal level. By this time the characters have grown and are exactly the types you want to have on your side when at war. The kinds who never give up on you and will do whatever they can to help their comrades in arms. Luke Skywalker has matured a lot but he is very young and still has to learn a lot. Han Solo is less the scoundrel and immensely heroic plus he makes it abundantly clear he loves Leia. Princess Leia of course pretends to dislike him but we all know she loves him too. She already was respected as a leader. Now more so since she is the last one to leave the battle. The dynamics between them is even better than in the original which makes sense since by now they have gone through a lot together and they know they can depend on each other no matter what. This is also the part where we get introduced to new characters. Yoda, The Emperor (Ian McDiarmid), Boba Fett and Lando Calrissian (Billy Dee Williams). Lando is a complicated character since he is the first character we come across who can't be boxed in as pure evil or good. Actually if you think about it he is the most human and perhaps even more responsible and noble than the Jedi's, Both Yoda and Obi-Wan want Luke to complete his training and forsake his friends even when all of them know they are in danger. Of course they have the bigger picture in mind but does that automatically excuse them? Lando on the other hand tries to do right by the people under his care and friend Han Solo. Granted his methods might be questionable but what would you do if you were in the same situation? He played it smart and was being practical. Then Yoda. Yoda is a puppet voiced and controlled by Frank Oz. If you had read this on paper before you had seen the result you probably would have laughed at the idea. And while Yoda does provide some comic relief he is a character to be taken seriously. Actually one you will take seriously since he is the ultimate Jedi master. He demonstrates this by lifting an X-Wing like it's nothing. But more so because Frank Oz makes you forget he is a puppet. Next to introducing important characters this sequel also increased the action and spectacle. A lot of substantial and meaningful eye candy. You are shown that the reach of The Empire is huge and their resources almost seem infinite. They have so many tools of destruction and death at their disposal. As it turns out the destruction of The Death Star barely had an impact on The Empire. It's very menacing and immensely terrifying if you think about it. And we get to see the first proper lightsaber battle. Luke versus Darth Vader. A battle that still holds up today because of the intensity and tension put in it and naturally because of the twist. The Empire Strikes Back ends on a real dark note in an already quite dark and gloomy film. However at the end you are looking forward to how their dire situation will get resolved. A cliffhanger done right. 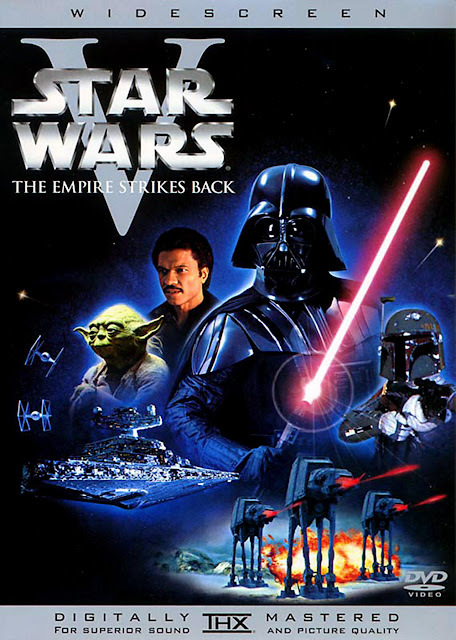 If you are new to the franchise and you want to know why Star Wars is being considered as one of the greatest franchises in the world then The Empire Strikes Back will point it to you.